Opt for quality garage doors in Lake Placid. In business for many years now, we know garage doors and openers like no one else. Our experienced technicians will exceed your expectations whether you need a garage door installation or a garage door opener repair. Contact us at 518-562-8310 to schedule an appointment for all of your garage door needs. The Village of Lake Placid is in the Town of North Elba in the Adirondack Mountains in the northwestern corner of Essex County. The Village is internationally known to proudly have hosted the Winter Olympics twice, in 1932 and 1980. Country-style, Ranch-style and Cottage-style are the common house designs we can see in this region. Visit our Design Centre to create the garage door that will fit your house architecture perfectly. As your garage door could break at any time, our garage door repair service in Lake Placid is available 24 hours a day. Maybe it is your opener that is not working? We can fix it too! Call 518-562-8310 to schedule an appointment with one of our technician in Lake Placid, Plattsburgh, West Chazy, Peru, Saranac Lake, Tupper Lake area, Malone and more. 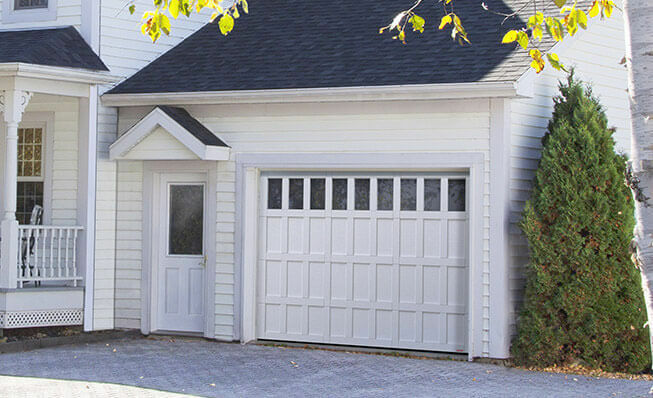 At North Country Garage Doors, we specialize in garage door installation, service, and maintenance. Your garage door is damaged, and you need to change a panel? Your door does not want to shut completely? We carry replacement parts for garage door repairs, including springs, replacement panels, garage door openers, and more. We are the specialist for garage door repair in Lake Placid. Blending traditional elements with the latest trends, the Townships Collection displays unique beauty and appeal. What catches your eye are its elegant woodgrain finish, the decorative hardware reminiscent of wrought iron, and its full range of decorative windows. Moreover, its R-16 thermal resistance gives you big energy savings. An important feature to consider if your garage is attached to your house. Take a look at our image gallery to see the options available. Why not add an electric garage door opener from LiftMaster to complete your garage door system? It will make your life easier, and they are the most reliable openers on the market. We have solutions for your commercial, agricultural and industrial garage doors, as well as residential garage door opener needs. Contact us today to get your free quote! Plattsburgh, Peru, West Chazy, Champlain, Roouses Point, Keeseville, Saranac Lake, Lake Placid and Tupper Lake area, Malone and Jay area.